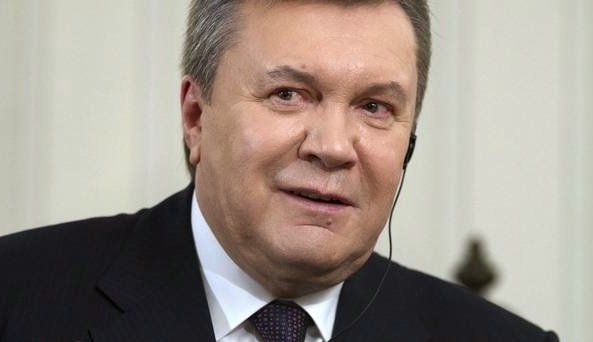 KIEV, Ukraine -- Ousted Ukraine President Viktor Yanukovych's government used a network of hired killers, kidnappers and gangs of thugs to terrorise the opposition, officials say. Ousted Ukrainian president Viktor Yanukovych fled the country after deadly clashes. There was evidence Russia's security service assisted their Ukrainian counterparts' attempts to suppress anti-government protests which culminated in bloodshed in February that left more than 100 dead, a top security official, speaking at the presentation of an official report in Kiev. Also, Prosecutor General Oleh Makhnitsky said 12 members of an elite riot police unit have been detained on suspicion of shooting protesters. Mr Yanukovych fled the capital, Kiev, after the culmination of the violence in February, precipitating the fall of his government. The identity of the snipers believed to be responsible for most of the deaths is subject of bitter disagreement. The interim government says Mr Yanukovych ordered snipers to be deployed - a charge he has denied in an AP interview. Opponents of the current leadership say snipers were organised by opposition leaders trying to whip up outrage. Mr Yanukovych told AP he "was wrong" in inviting Russian troops into Crimea, which was swiftly annexed by Moscow following a referendum in which reunion with Russia was backed by 97% of those who voted. Ukraine's fledging government and Western leaders have expressed concern about a recent build-up of Russian forces near the Ukrainian border. President Vladimir Putin told German Chancellor Angela Merkel last week that the troops were there for military exercises and that one battalion has already left. Mr Yanukovych did not answer several questions about whether he would support any Russian move into other areas of Ukraine on the pretext of protecting ethnic Russians. Russian Foreign Minister Sergey Lavrov today offered further assurances, telling reporters that Russian troops "will be returning to the place of their permanent quarters as soon as other participants of the exercise have completed their tasks". Mr Lavrov, however, accused the Ukrainian government "and their patrons in the West of blowing this out of proportion," adding that Russia did not violate any international norms by sending additional troops to its own borders. US Air Force Gen Philip M Breedlove, who commands all NATO forces in Europe, said Russia has 40,000 troops along the border with Ukraine, and that they are capable of attacking by land and air on 12 hours' notice. The sheer size and posture of its forces are destabilising although the Russians' plans remain unknown to NATO, he said.